This is the left panel of a triptych depicting Ebijūrō, Utaemon III, and Matsue III. 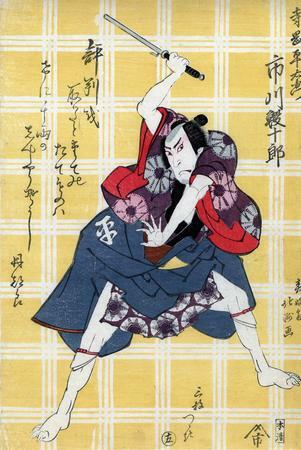 This performance of the play Ōishizuri Sakura Tanzaku must have been great as it has been depicted by artists of both Hokushū and Yoshikuni circles. This print helps commemorate a performance at the Naka Theater in 3/1822. In Schwaab's Osaka Prints. page 86, plate 45. "In this print, which is the left print of a triptych (see also S2004.3.260), Ichikawa Ebijuro I plays the character of a kabuki policemen known as torite. The bold, patterned background, a common feature in Osaka actor prints, is rendered in reserve, and is based on the actor's family crest. to deserve a thousand ryō. Translation of poems by John T. Carpenter"
1) Ikeda Bunko, Kamigata yakusha-e shūsei (Collected Kamigata Actor Prints), vol. 1, Ikeda Bunko Library, Osaka 1997, no. 122. 2) Masterful Illusions: Japanese Prints in the Anne van Biema Collections, p. 149.